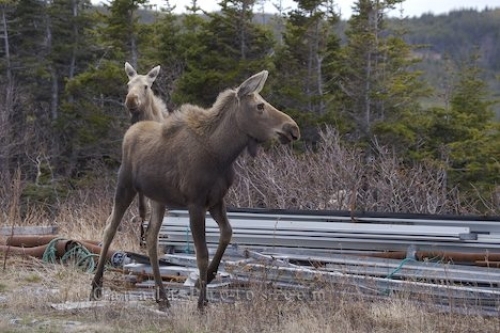 Two moose have no problem exploring privately owned property in the town of St Lunaire-Griquet in Newfoundland, Canada looking for some grazing areas. The wildlife is often seen when driving through the town, so be extremely careful of any moose crossing the highway but be sure to stop and capture a picture. Moose, Alces alces, grazing in a property in St Lunaire-Griquet, Highway 436, Viking Trail, Northern Peninsula, Great Northern Peninsula, Newfoundland, Canada. Picture of the wildlife trespassing on private property in the town of St. Lunaire-Griquet in Newfoundland, Canada.